Even if the extent of your crustacean knowledge is Mr. Krabs of "SpongeBob" fame, don't rule yourself out as a hard-shelled pet owner. 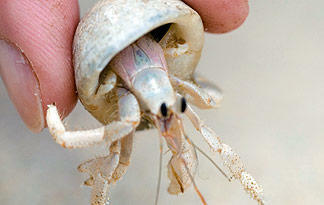 Hermit crabs are interesting, active little creatures. They have five sets of legs, a tiny head equipped with long antennae and, of course, a shell. Being called a hermit is quite a misnomer, because these tiny pets can be very social and active -- especially in the evenings. They burrow in the sand, crawl on top of rocks and will even curiously investigate items in their environments. Occasionally, you may even hear a chirping sound from your hermit crab. Feeding: Commercial pellets, dechlorinated fresh water and salt water, occasional fruit. Housing and Exercise: Hermit crabs can live in terrariums. They thrive at temperatures of about 75 degrees Fahrenheit (24 degrees Celsius) and love humid conditions, which can be encouraged with a daily misting. With sand to dig and rocks to climb, hermit crabs don't need additional exercise.